While these days it seems that vintage manual-wound Rolex Daytona chronographs are the stars of the auction world and watch collecting circles, it was only when the Daytona became an automatic watch that it really captured the public’s attention. Back in the day, the hand-wound Daytona chronographs were deemed as passé given their smallish 37.5mm case sizes and caliber type. In the late 1980s, Rolex finally modernized their flagship chronograph collection with the release of the automatic Daytona watches. Join us as we delve into the history and evolution of the automatic Rolex Daytona to see how it all began and where it stands today. Rolex unveiled the first automatic Daytona watches in 1988. While these watches featured a similar style to the preceding manual-wound Daytona watches, these were different chronographs altogether. First, they featured larger 40mm Oyster cases, which were equipped for the first time with crown guards. Just like the later models of the four-digit Daytona watches, the new five-digit ones included screw-down chronograph pushers, as well as the robust Triplock winding crown. What’s more, Rolex furnished the then-new Daytona watches with scratch-resistant sapphire crystals rather than acrylic ones. While the new dials kept the trio of registers at 3, 6, and 9 o’clock, there were some design modifications. For instance, the white gold applied baton indexes now included pointed tips, the subdials featured borders rather than being completely filled in, and luminescence was applied more generously. Additionally, the automatic Daytona watches from this era only had metal bezels (no more aluminum inserts), of course, engraved with the signature tachymeter scale. However, the biggest change to the Daytona collection was the use of an automatic movement. The first generation of the automatic Rolex Daytona watches ran on Caliber 4030 with a 54-hour power reserve. This is not an in-house movement but rather, one that is based on the famous Zenith El Primero chronograph movement with a column wheel and horizontal clutch. Yet, Rolex did heavily modify the movement to suit the needs of the Daytona including removing the date, dropping the frequency rate from 36,000bph to 28,800bph, and adding a new escapement. Overall, it’s estimated that Rolex made over 200 modifications to the original Zenith El Primero caliber to created the completed Cal. 4030. 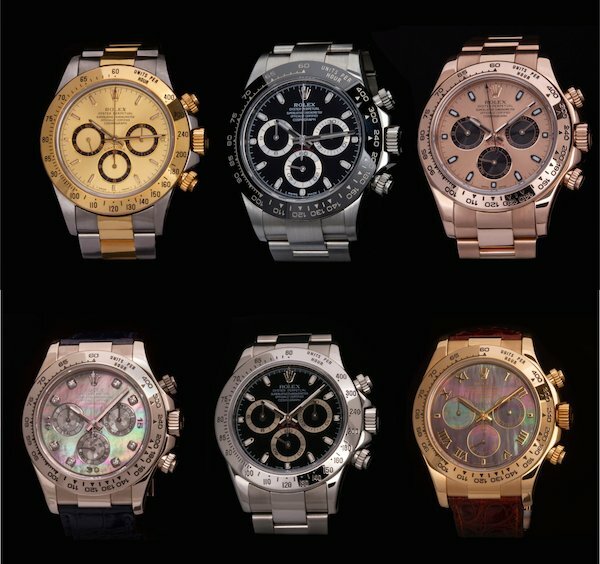 For the company’s first automatic Daytona collection, Rolex released a vast array of editions featuring different materials, bracelet choices, dials options, and gem selections. There was the stainless steel Daytona ref. 16520, the two-tone steel and gold Daytona ref. 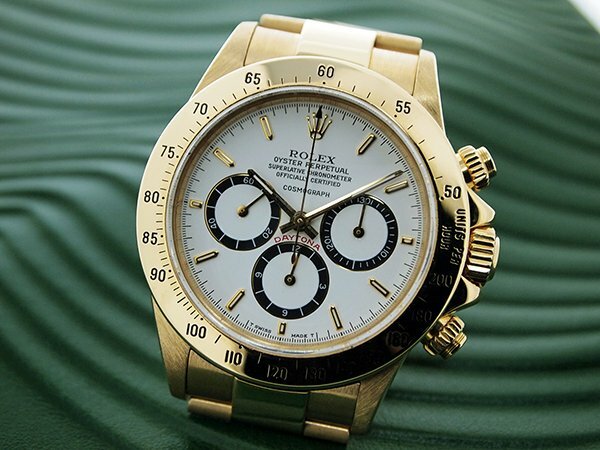 16523, and the full 18k yellow gold Daytona ref. 16528, all fitted with Oyster bracelets. Then there are the leather band options as seen on the yellow gold Daytona ref. 16518 and white gold Daytona ref. 16519. There’s even an ultra-rare (it’s estimated that only five were ever made, commissioned by former Rolex chief executive Patrick Heiniger) platinum version, the Daytona ref. 16516. In 2000, Rolex unveiled a brand new in-house chronograph movement, the Caliber 4130. Rather than using an outsourced movement base, this time the Swiss watch giant built their own from scratch. Packed with a slew of inventions, patents, and cutting-edge mechanics, the Rolex Caliber 4130 automatic chronograph movement utilizes a more efficient vertical clutch system rather than the more common lateral clutch system. As a result, the tendency for the chronograph hand to jitter is eliminated. Furthermore, using the chronograph functionality doesn’t affect the watch’s timekeeping capabilities. What’s more, compared to the Cal. 4030, the Cal. 4130 boasts a longer power reserve of 72 hours. Finally, because the Caliber 4130 uses fewer screws and parts than its predecessor, it’s easier for watchmakers to service. The new Caliber 4130 movements made their debut in a brand new collection of Daytona watches, this time with six-digit reference numbers. The in-house movement powered Daytona watches retained most of the same design, such as the characteristic 40mm Oyster cases and screw-down pushers and winding crown. However, because of the new movement, the dial included some modifications. Most notably, the subdials at 6 o’clock and 9 o’clock switched positions so that the running seconds now sits at 6 o’clock. Furthermore, the three registers are spread a little further apart compared to the ones on the Zenith Daytona watches. In terms of model styles, there are plenty to choose from within the six-digit Daytona collection. There’s the stainless steel Daytona ref. 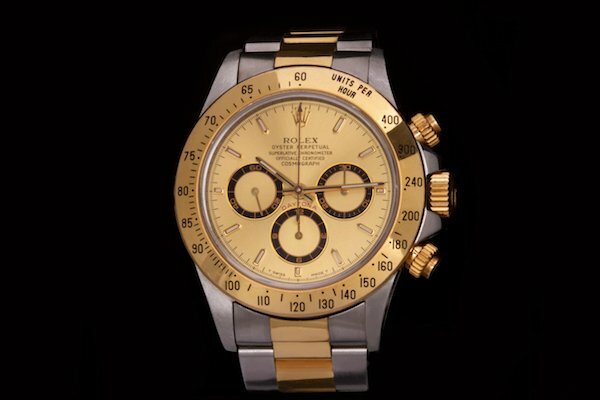 116520, the two-tone yellow gold and steel Daytona ref. 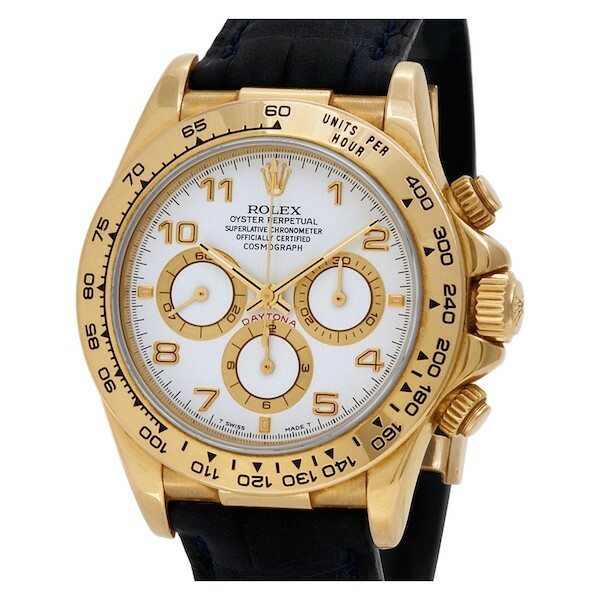 116523, the yellow gold Daytona ref. 116528 and ref. 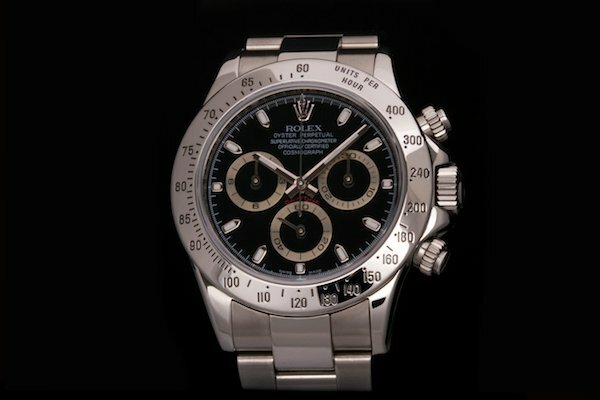 116508, and the white gold Daytona ref. 116529 and ref. 116509. For leather strap Daytona models, there’s the yellow gold Daytona ref. 116518 and the white gold Daytona ref. 116519. Plus, a first for the Daytona collection, in 2008 Rolex added an Everose edition with the Daytona ref. 116505. 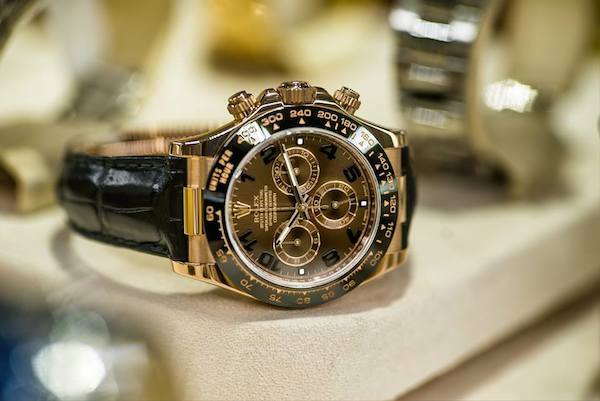 Finally, Rolex also made several ultra-lavish gem-set versions such as the Daytona “Rainbow” watches, the Daytona “Leopard,” and platinum Daytona watches blanketed with diamonds. In 2011, Rolex added a brand new feature to the Daytona collection–a ceramic bezel. This followed in the footsteps of Rolex’s other sports watches like the GMT-Master II and the Submariner, which already had versions equipped with the scratch-resistant and fadeproof Cerachrom ceramic bezel. The first Daytona to feature the Rolex-patented ceramic alloy was the Everose Daytona ref. 116515LN with a black bezel. 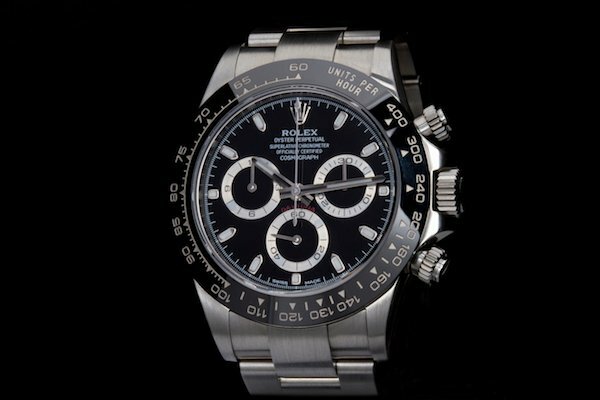 Following this, Rolex released the special anniversary Daytona ref. 116506 in 2013 in platinum with a brown ceramic bezel. This was the first time the Daytona was available to the public in platinum. Over the next years, Rolex started adding the coveted ceramic bezel to a host of different metal Daytona watches including the white gold Daytona ref. 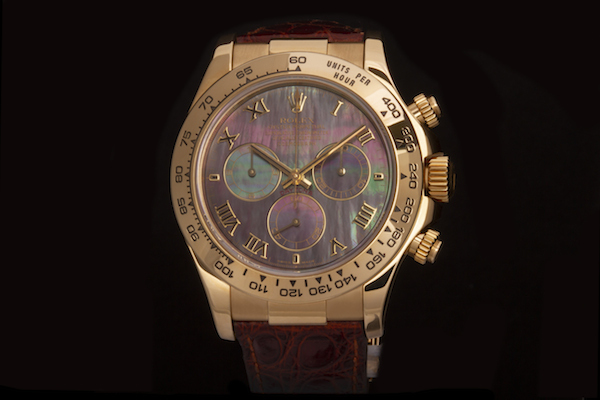 116519LN and the yellow gold Daytona ref. 116518LN. However, the most popular ceramic Daytona model to date is the stainless steel Daytona ref. 116500LN in stainless steel, which came out in 2016. It’s important to note that the newer Daytona watches with ceramic bezels also run on the in-house Caliber 4130 movement. However, Rolex did redefine their “Superlative Chronometer Officially Certifed” label in 2015 to guarantee a -/+ 2 accuracy rating and a longer five-year warranty. It’s hard to overstate the popularity of the Rolex Daytona. It is one of the most sought-after and recognizable luxury chronograph watches in the world. With an appealing combination of fantastic design, impressive mechanics, and a wide choice of materials and styles, it’s no wonder that the automatic Daytona became the must-have chronograph despite its once slow-selling predecessor. A triumphant finish to a sluggish start, indeed!